A Flea is a tiny brown bug, no bigger than the head of a pin. If you have a dog or a cat it is likely that you have seen fleas. Often times these pests are brought into your home on your animal’s fur. Once in your home, they can hide in carpeting or jump onto people. Tiny claws at the end of their legs enable them to attach to people or animals. This bite will generally itch, and bites will appear in groups of three or four bites. 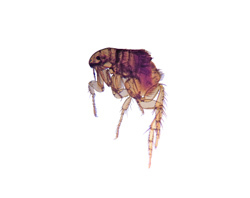 What makes fleas dangerous is that they sometimes carry diseases. Keeping your animals clean and Flea free is one of the best things you can do to prevent fleas from entering your home. If you currently have a flea problem though, hiring a professional exterminator is what you should really consider. At Eco Tech we treat your entire home and yard, greatly reducing the amount of fleas in the area. We also treat to prevent more fleas from reproducing, putting an end to the problem using our less toxic organic product line.